My only care is the health and behavior I have been searching the last month for the puppy and it seems difficult to find the one that really match your needs (as fas as its potential mostly i think). It is also a little bit strange with the breeders i have spoken to and difficult to trust one. All have the best puppies. I do not know much about, but it seems to me that you can not have it all, ..though I think that the choice that match better to my needs is one that is appropriate for an easygoing family life and at the same time able for protection. What do you think? I'm in the correct direction or not? Most comments on your website refer to the gsp showline or refer also to the working line? Hi, Konstantinos. I'm glad you're doing your research first before bringing a new German Shepherd into your life. And you're right, there is a lot to think about. Female German Shepherds can make great family dogs (not to say that a male couldn't do that as well) but if I were you I wouldn't worry so much right off the bat about protection capabilities and all that - that will come from the right kind of training (and lots of it - so be careful how you handle this). 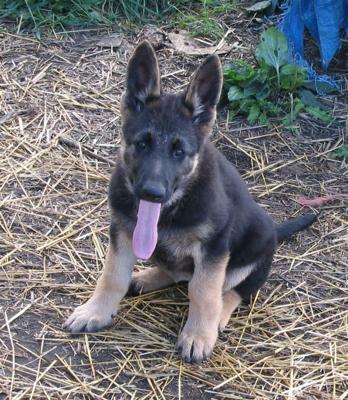 If I were you I would be more concerned in getting the best German Shepherd to fit your family - laid back, high energy, etc - and a good GSD breeder with loads of experience and references can help match you up with the right GSD puppy. And of course all breeders have the best dogs - they are all proud of their litters and animals. If I were you I would be more interested in finding a family pet perfect for your family and then bonding with that puppy like crazy. As the puppy gets older you can add training - just don't be quite so concerned with protectiveness to start - you can train for those issues later. And if you're worried about expenses, why not see if there are any good German Shepherd rescues in your area? That way you would be helping an animal in need and finding a great new puppy for your family too. Hope this helps - good luck!